Oliver Peoples "Rayette" cat-eye sunglasses in metal. Ultra-feminine, modern interpretation of 1970's bohemian style. Hand-engraved feather filigree design is a special 30th anniversary detail. 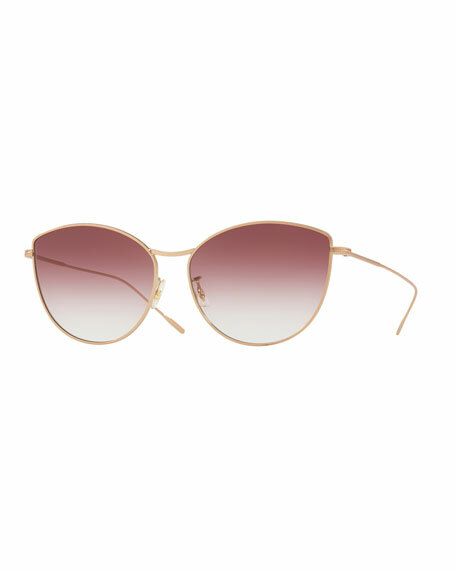 Linda Farrow square sunglasses in acetate with removable clip-on lenses. Lens/bridge/temple (in mm): 47-20-140. Lightweight titanium hardware with 18-karat, white gold plating. Square mirrored lenses. Clip-on creates straight brow. Double pin stud detail at temples and frame front. Tapered temples. 100% UVA/UVB protection. Made in Japan.